Anime Expo 2016 Day 0 | Pickup and rundown of what's to come — Oh no, Anime! 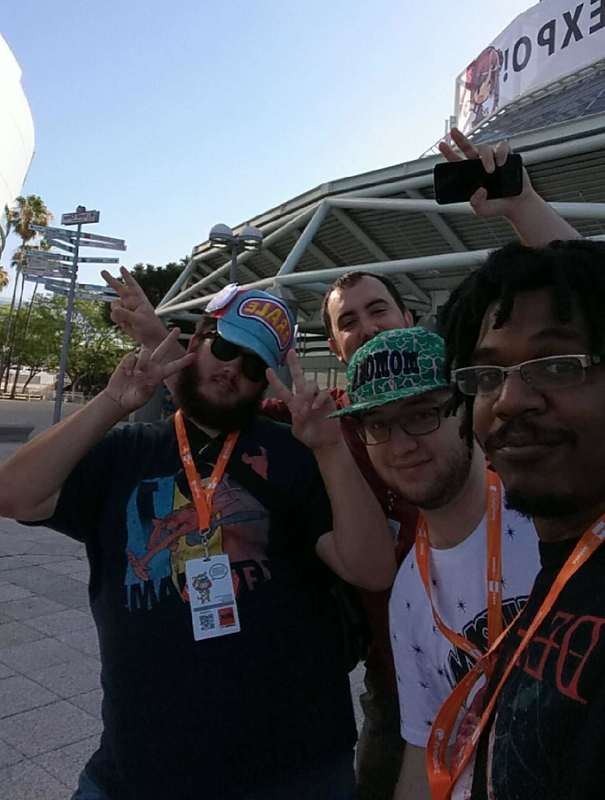 We made it safely to Anime Expo! Check out above for a short video detailing our day 0 exploits and what's to come, or hit the jump below to see it all in text (and picture) form. Day 0 is an important part of any huge convention - can't do much without your badges! Luckily for us, the line lasted all of 10 minutes, a far cry from the 4 hour+ wait of 2014 and earlier. On top of that we were able to pick up the all-important event passes! Both Marc and myself are planning on hitting the Love Live! Sunshine!! Aqours, Japan Super Live, and Anison Band Battle events. The LL Sunshine event consists of six of the actresses/idols from Aqours (pronounced 'aqua') doing... something! More details are unavailable as of yet, stay tuned. The Japan Super Live is arguably the main event of Anime Expo this year. Anime Consortium Japan (they run streaming site Daisuki too) has brought an absolute ton of Japanese musical guests over to play a 4 hour concert at the Microsoft Theatre. Eir Aoi, JAM Project, Luna Haruna, Minami, sphere, T.M. Revolution, Yoko Ishida, and DJ Kazu are all making an appearance. It's pretty much going to blow our friggin brains out! And finally, the next day, we have the Japan Band Battle featuring FLOW and OLDCODEX. I've got my money on FLOW (who doesn't love to belt out JIBUN WOOOO~ at the top of their lungs?!) winning this band battle. But honestly, I think everyone knows the real winners are the people in the crowd for this one. Back to day 0 though, us being the crazy warship nerds we are, went to see the USS Iowa before picking up our tickets. The size and majesty of an Iowa-class battleship is not something that can be properly conveyed by pictures, but here's a picture anyway! But for now, it's time to rest up for day 1! Look forward to the rest of our coverage right here, on Facebook, on twitter, and of course, on our YouTube.